The previous frames of the input clip are processed with a pixel diffusion process and then combined with the current frame. The output of each processed frame is stored and then combined with the next frame. The trails are reinitialized whenever a non-consecutive frame is processed, either the first frame, reprocessing a given frame, or jumping to another frame. You must process multiple frames of a clip in a row to observe the effect, and clearing your image cache before rendering may sometimes be necessary. Prev Brightness: Default: 0.8, Range: 0 or greater. For each frame, the previous output is scaled by this amount before it is combined with the new input frame. Normally this value should be less than 1.0 which causes previous frames to fade out over time. A value of 1.0 causes no fading, and values greater than 1.0 cause previous frames to become brighter over time. Prev Color: Default rgb: [1 1 1]. For each frame, the previous output is scaled by this color before it is combined with the new input frame. This is similar to Prev Brightness but affects the colors of the previous frames instead of just the brightness. Prev Hue Shift: Default: 0, Range: any. Shifts the hue of the previous frames' colors, for each new frame. Combine New: Popup menu, Default: Ave .
Selects the method for combining previous frames with the current frame. Ave: The current frame is averaged with the previous output, smearing moving objects out over time. The output is scaled by Fade and the input is scaled by 1.0-Fade for a weighted average, so Fade must be less than 1.0 for this to work properly. Unlike the other combine options, Ave should never affect the brightness of stationary objects in the clip. Max: The colors of the current frame and previous frames are combined with a maximum function. This makes the output frame at least as bright as the current frame, and will make brighter 'trails' for example if you have bright objects moving on a dark background. Screen: The colors of the current frame and previous frames are combined with a blend function. This can be used to accumulate the colors of a moving clip. However, non-black regions will become brighter with each frame. Add: The colors of the current frame and previous frames are added. This can also be used to accumulate the colors of a moving clip, with the non-black regions becoming brighter at each frame. Over: The current frame is composited over the previous frames using its Alpha channel. This uses pre-multiplied compositing, so where the alpha is black the Source image should normally also be black. If the input clip contains no Alpha channel, the luminance is used instead. Under: The current frame is composited under the previous frames. Min: The colors of the current frame and previous frames are combined with a minimum function. This makes the output frame no brighter than the current frame, and will often fade quickly to a black frame. New Color: Default rgb: [1 1 1]. Scales the color of the current frame. Set this to the complement of Old Color to offset overly colored trails. New Opacity: Default: 1, Range: 0 to 10. Scales the opacity and brightness of the current frame. Diffuse Amount: Default: 0.028, Range: 0 or greater. The previous frames are passed through a pixel-diffusion process of this magnitude, for each new frame. This has no effect unless it is positive. 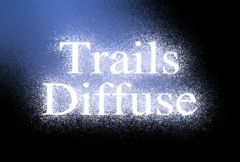 Diffuse Rel: X & Y, Default: [1 1], Range: 0 or greater. The relative horizontal and vertical amounts of the pixel diffusion process. This has no effect unless Diffuse Amount is positive.